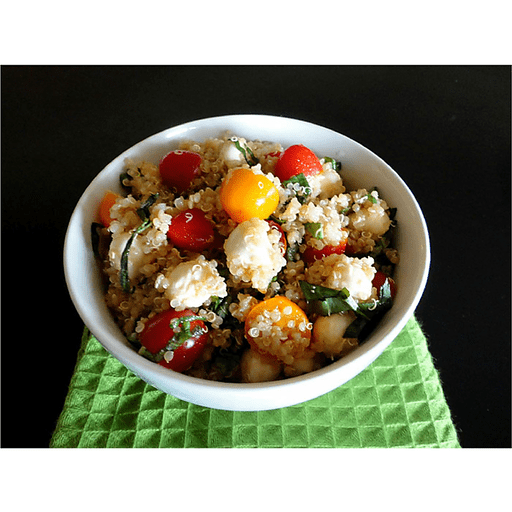 Quinoa Caprese Salad is an awesome recipe that brings together all the same ingredients in a traditional caprese salad, but with a fun, new twist! 1. Rinse quinoa under cool running water using a fine mesh strainer. Drain well and add to a saucepan along with 2 cups of water. Bring to a boil, reduce heat to a simmer, then cover and cook for 15 minutes or until water is absorbed. Let cool completely to room temperature. 1. Meanwhile, in a large bowl whisk together the balsamic vinegar, olive oil, salt and pepper. Add the dressing to the halved tomatoes and toss gently to combine. Set the bowl in the fridge while the quinoa is cooking/cooling to allow the tomatoes to marinate. 1. After the quinoa has cooled to room temperature, gently mix the cooled quinoa with the marinated tomatoes (add the dressing they were marinating in as well), mozzarella pearls, and fresh chopped basil. Serve immediately or refrigerate until ready to serve. For gluten free: Use certified gluten free quinoa. Calories 200, Total Fat 12g(Saturated 4g, Trans 0g), Cholesterol 20mg, Sodium 200mg, Total Carbohydrate 16g (Dietary Fiber 2g, Sugars 3g), Protein 8g, Vitamin A 15%, Vitamin C 10%, Calcium 15%, Iron 6% *Nutritional values are an approximation. Actual nutritional values may vary due to preparation techniques, variations related to suppliers, regional and seasonal differences, or rounding.